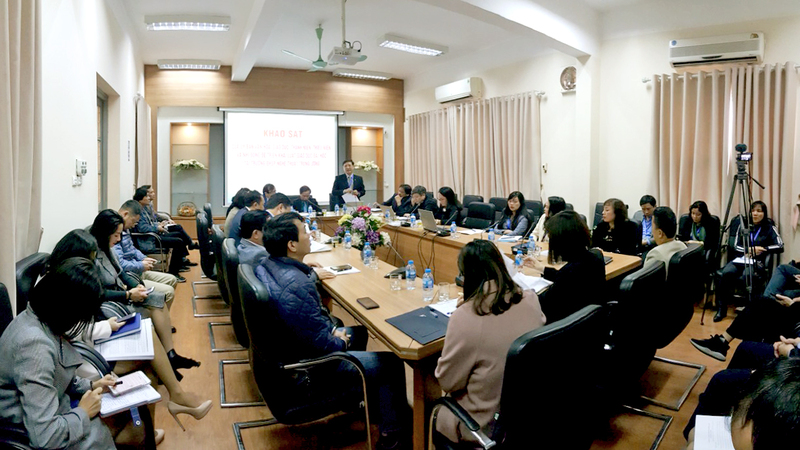 On January 25, the National University of Art Education was honored to welcome the Delegation of the Committee for Culture, Education, Youth and Children - the XIV National Assembly to visit and work at the University. 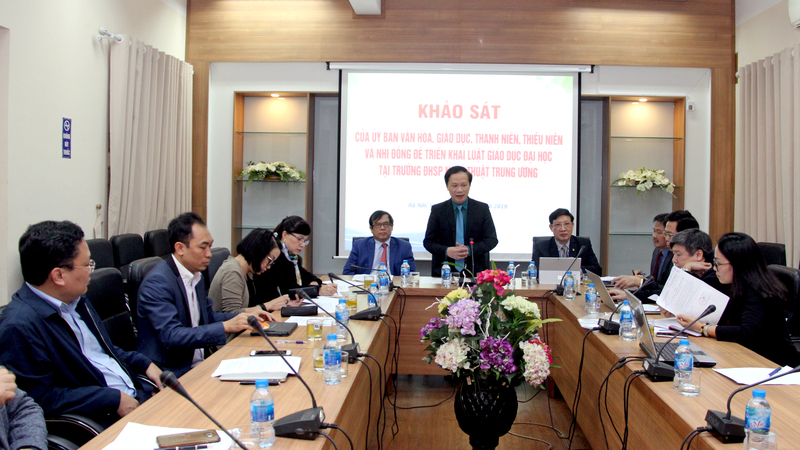 On the side of the Committee, there were Mr. Pham Tat Thang, Vice Chairman of the Committee, National Assembly of Vinh Long province as the leader; Mr. Nguyen Quoc Hung, Standing Member, National Assembly of Hanoi City; Mr. Vu Minh Dao, Director of Culture, Education, Youth and Children Department. 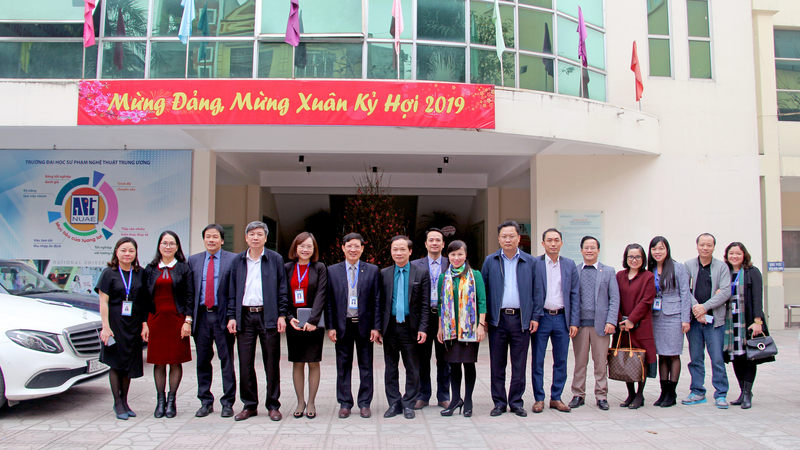 On the Ministry of Education and Training, there were Mr. Nguyen Thi Kim Phung, Director of the Higher Education Department; Mr. Ta Ngoc Don, Director of Department of Science, Technology and Environment; Mr. Pham Xuan Hau, Deputy Director of the Organization and Personnel Department. 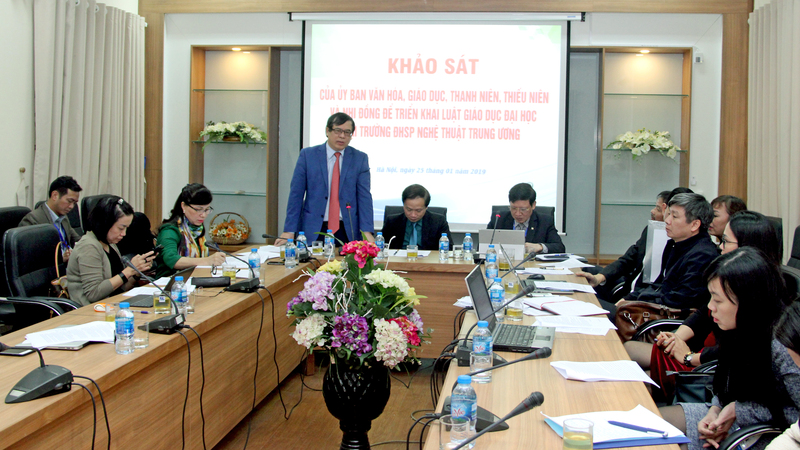 On the Ministry of Culture, Sports and Tourism, there were Mr. Bui Quang Hai - Deputy Director of Training Department. On the side of the National University of Art Education, Assoc. Prof. Dr. Dao Dang Phuong - Secretary of the Party Committee, Rector of the University, comrades in the Executive Committee of the Party Committee, Board of Directors, leaders of the units, the university’s unions. 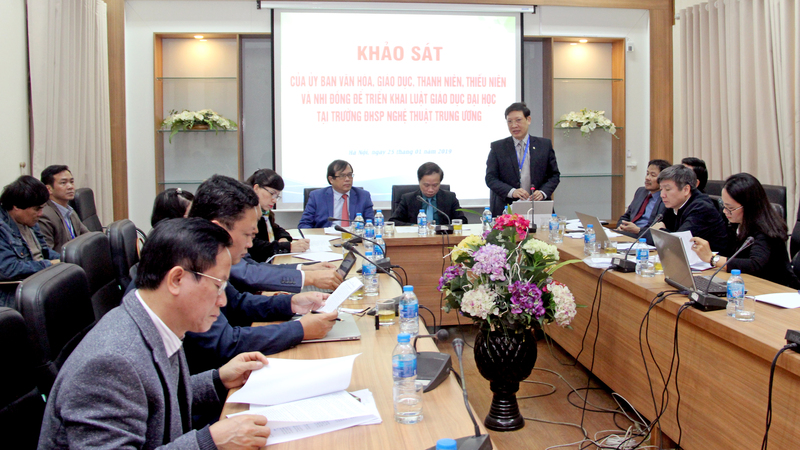 At the beginning of the meeting, Mr. Pham Tat Thang, Vice Chairman of the XIV National Committee for Culture, Education, Youth, and Children said that the aim of the delegation was to survey the implementation of the policy, law on higher education of some training models, including universities of specialized arts and culture sectors, from which to consider the process of revising laws of the government and parliament has met the requirements of practice or not. At the same time, taking voices from the models of different types of training university together with the government to issue documents guiding the implementation of higher education law. Mr. Pham Tat Thang emphasized that the National University of Art Education has an important role in the implementation of the higher education law and the next is the revised education law as well as the Resolution 88/2014 / QH13 of the National Assembly on renewing general education curricula and textbooks in response to the need for teachers of music and fine arts subjects of general education schools nationwide. At the meeting, on behalf of the Board of Directors of the National University of Art Education, Assoc. Prof. Dr. Dao Dang Phuong - Secretary of the Party Committee, Rector presented a report on the achievements made in the typical aspects of the University, including outstanding training, the University is training 10 disciplines and 4 majors in undergraduate degree, 3 majors in master's degree, 01 major in doctoral degree. In particular, on July 3, 2018, the National University of Art Education was recognized to meet the quality standards of education and was granted a certificate of educational quality accreditation. This is an important milestone marking the new development path of the National University of Art Education, improving the position and reputation of the University, creating trust with society and learners about quality, prestige and influence. The University has been actively promoting international cooperation activities in many fields, especially in the field of training and scientific research. So far, it has signed cooperation with many universities and colleges around the world such as Italy, Russian Federation, China, Lao People's Democratic Republic. From there, opened valuable opportunities for teachers, students quickly get acquainted and catch up with the current international integration trend. In addition, the report also mentioned the difficulties and recommendations of the University about the Council, autonomy of higher education finance, scientific research for art lecturers, autonomy admission, propose to build a network of cooperation and coordination between art teacher training schools, investment in facilities to meet the requirements of a higher education institution. During the meeting, the delegation and the university leaders also exchanged frankly, open up the problems and proposals during the implementation of documents guiding the implementation of the Education Law. 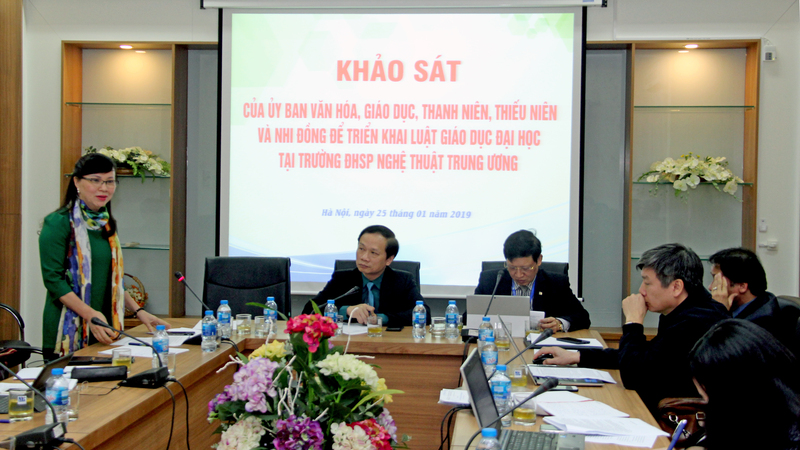 At the end of the meeting, Mr. Pham Tat Thang, Vice Chairman of the National Committee XIV for Culture, Education, Youth and Children highly appreciated the report, helping the delegation understand clearly about the university’s situation in the implementation of Education Law. Based on this fact, the delegation will synthesize and report to propose the National Assembly to consider amendments and supplements according to actual requirements, creating conditions for art and cultural schools to promote well potential in the coming years.